Six lanes of Interstate 85 curve underneath a network of ramps carrying traffic between Interstate 285, Georgia 14 Spur, and the I-85 mainline. Originally a three-wye directional interchange joined the three routes with access to GA-14S only available from Interstates 85 south & 285 west. Photo taken September 28, 2010. Totaling 179 miles through the Peach State, Interstate 85 leads northeast from Montgomery, Alabama through the capital of Atlanta en route to Greenville, South Carolina. 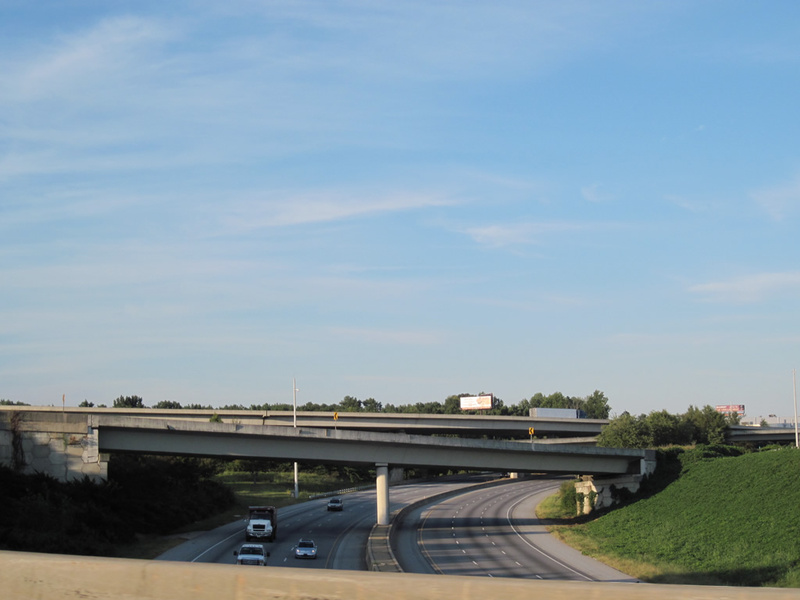 Doubling as a commuter route for the Atlanta metropolitan area, the freeway carries six lanes or more from the Coweta County line near Exit 35 to Georgia 20 (Exit 115) at Buford. An overlap with Interstate 75 along the Downtown Connector in Atlanta swells the freeway to 16 overall lanes along the eight mile stretch. A major fire started underneath the elevated lanes of Interstate 85 at Piedmont Road (Georgia 237) in northeast Atlanta on March 30, 2017. The fire caused a 350 foot section of the northbound viaduct to collapse and significant structural damage to an adjacent 350 foot section of the southbound structure. A closure of the Northeast Expressway was implemented in both directions from the split with I-75 north to Gerogia 400 until April 1, when northbound traffic was opened from I-75 to Exit 86 (Georgia 13) and from the Georgia 13 on-ramp ahead of Buford Highway. The entire bridge structure will be rebuilt.9 Reopening of the freeway was anticipated for June 15, 2017. The final stretch of I-85 built in Georgia was the segment leading north from GA 219 at La Grange to U.S. 27 Alternate & 29 south of Newnan. Video shot by AARoads of Interstates 85 and 285 north through Atlanta on June 6, 1996. Georgia 219 (Whitesville Road) leads south from Downtown LaGrange to meet Interstate 85 at a diamond interchange (Exit 13). A handful of travelers services lie on both sides of the exchange. Photo taken 06/24/10. Georgia 109 (Greenville Road) enters the city limits of LaGrange and quickly expands into a four-lane divided highway through the parclo interchange with Interstate 85. Photo taken 04/13/12. Interstate 85 leads southwest from SR 109 (Lafayette Parkway) and LaGrange to West Point, Opelika, Auburn and Montgomery, Alabama. Photo taken 04/13/12. Lafayette Parkway continues west from Interstate 85 to become an undivided commercial arterial to LaGrange Mall and Georgia 14 Spur (South Davis Road). Photo taken 04/13/12. Entering the parclo interchange with I-85 on Georgia 109 (Lafayette Parkway) eastbound. Interstate 85 straddles the southeastern periphery of LaGrange between West Point and Hogansville. Photo taken 04/13/12. A shield for the northbound loop ramp to Interstate 85 north hangs above the eastbound lanes of Georgia 109. Lafayette Parkway transitions into rural Greenville Road east of I-85 to Mountville. Photo taken 04/13/12. An Interstate 185 trailblazer accompanies the I-85 shield and guide sign for the northbound on-ramp to Atlanta. Interstates 85 and 185 come together just northeast of Georgia 109 and Exit 18. Photo taken 04/13/12. Collinsworth Road expands to three lanes through the diamond interchange (Exit 56) with Interstate 85. Photo taken 09/28/10. Collinsworth Road joins Palmetto and Tyrone along a rural stretch of highway in northeastern Coweta County. 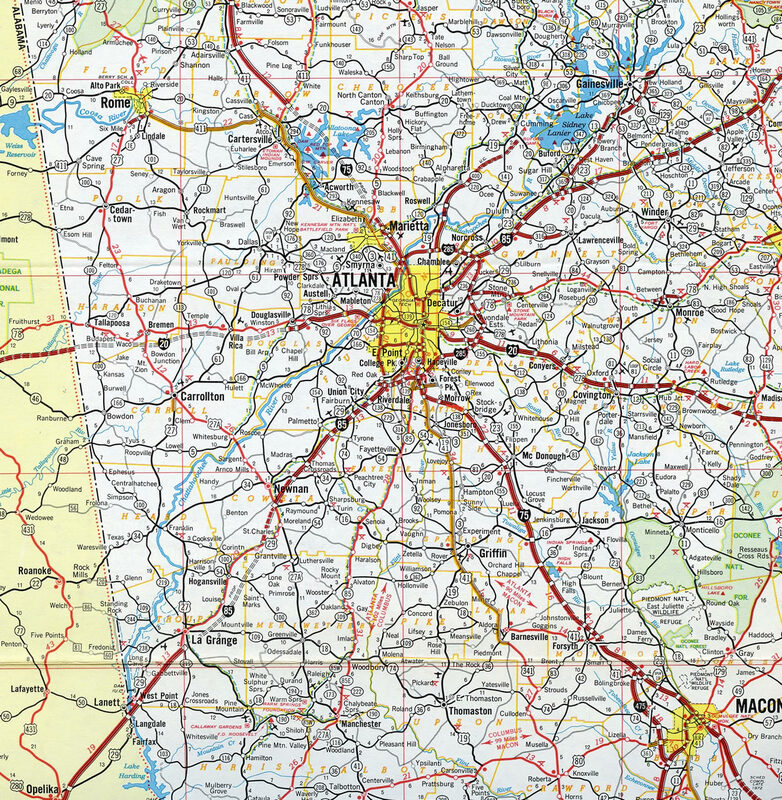 Interstate 85 north exits the county for Fairburn, Union City and Atlanta. Photo taken 09/28/10. A ramp meter in operation on the northbound on-ramp to Interstate 85 from Georgia 74 at Fairburn. Ramp meters were instituted on Atlanta area Interstates starting in June 2008. The signals at GA-74, GA-138, Flat Shoals Road and Riverdale Road became operational on July 1, 2010.6 Photo taken 09/28/10. "Atlanta's freeways on road to recovery." The Atlanta Journal and The Atlanta Constitution, July 19, 1985. "Freeing Downtown Connector still two years down the road." The Atlanta Journal and The Atlanta Constitution, December 1, 1986. "HOV work inside I-285 to clog traffic - Yearlong project: Creation of additional lanes - is supposed to be finished by the start of the '96 Olympics." The Atlanta Journal and The Atlanta Constitution, May 20, 1995. "DOT: No problems with ramp meters at Hwy. 74/I-85" The Citizen, July 6, 2010. "Ga. 316 remake: No pain, no gain - Officials to break ground today." Atlanta Journal-Constitution, The, February 20, 2006. "I-85 Express Lanes face first rush hour test." 11Alive, October 3, 2011. "Fire erupts on Atlanta interstate overpass, prompting parts to collapse." WYFF (Atlanta, GA), March 31, 2017. "I-85 northbound lanes reopen in Atlanta." Atlanta Journal-Constitution, May 12, 2017.